In this Kodi How-to-Use guide, we show you how to take total control of Kodi: the world’s most popular media player. IMPORTANT: If your Kodi is “empty”, then you may need to follow my Kodi build guides to install a Kodi Build. For example, Xenon Build, Supreme Builds, and No Limits Build. On the other hand, if you already have a bunch of stuff to stream in Kodi already, then follow the Kodi How-to-Use guide below. If you already have a Kodi build installed, then scroll past the video below. Or if you don’t have a Kodi build installed, then use the video below! Ok, so the Kodi build thing is all taken care of now. It’s time to learn How to Use Kodi! Here’s the scenario: Let’s say you’ve downloaded and installed Kodi and you’re ready to enjoy your favorite movies and TV shows, but there’s one problem… You are having a hard time navigating through Kodi using FireTV remote—so much so that twice in your frustration you almost banged the remote on the wall. Well, calm down and breathe easy. Help is right here! You’ll find all answers to all your “Kodi how to use” questions. Operating Kodi with FireTV remote is easy-peasy, once you know a couple of things. Let’s look at them and also check out in detail how to use the FireTV remote to navigate through Kodi. Alright – it’s time to learn how to use Firestick remote to control Kodi. Let’s select a movie, and then use the Play/Pause/Skip buttons, and do much more. Yes, we know you love the Alexa Voice remote. You enjoy that your Amazon Fire TV listens to you and does exactly as you instruct it (How uncomplicated life would be if our spouses were equally responsive!). Well, Kodi is not so obliging—at least not right now. You can launch Kodi with Alexa Voice, but can do nothing more. This is because Alexa voice control doesn’t seem to function inside Kodi. So, forget Alexa Voice when using Kodi; instead use the navigating buttons on your Amazon FireTV stick remote. This is the other big problem folks have while using FireTV remote with Kodi. When you press the Home button inside Kodi to get to the Kodi’s home screen, you are taken to the FireTV home screen instead of Kodi TV home screen. This is because FireTV remote Home button doesn’t work inside Kodi. The workaround is to press the back button anywhere inside Kodi to access its home screen. Here are the steps to watch movies on Kodi with your FireTV remote. Note: This guide assumes that you have Exodus for Kodi installed. Or you have a Kodi build installed which contains Exodus, such as Kodi No Limits Build, Xenon Build, or Kodi Supreme Builds. On your FireTV, you will see the main menu on the left screen. Scroll it using the up and down buttons on your FireTV remote to go to Apps. In Apps, use the left and right buttons on the Fire TV remote to browse through the installed apps. Select Kodi and press the centre button on your FireTV remote to launch it. You are likely to see a pop-up when Kodi starts. Press the back button on your remote to give it a pass. Next, use the left and right buttons on your FireTV remote to browse through different options in Kodi such as music, pictures, videos, etc. TIP: If you need to set up Kodi for streaming TV and movies, then check out my Kodi build install guides. Go to videos and then Add-ons and press the centre button. If a dialog box appears on the screen here, just press the Ok button. Next, select Exodus and hit the centre button on the remote. Use the down button on the remote to go to movies. Now you can the select a category (such as most popular, people watching, most voted, etc.) by hitting the centre button on your remote. A list of movies in the category will appear on the screen. Use the right, left, up and down buttons on your FireTV remote to browse through the list. A list of available links will appear on your TV screen. Use the up and down buttons on your FlashTV remote to scroll through different links and use the centre button to select a link. You might want to keep in mind that 1080P option can take a lot of bandwidth, so you might be better of selecting HD option. We’re done! 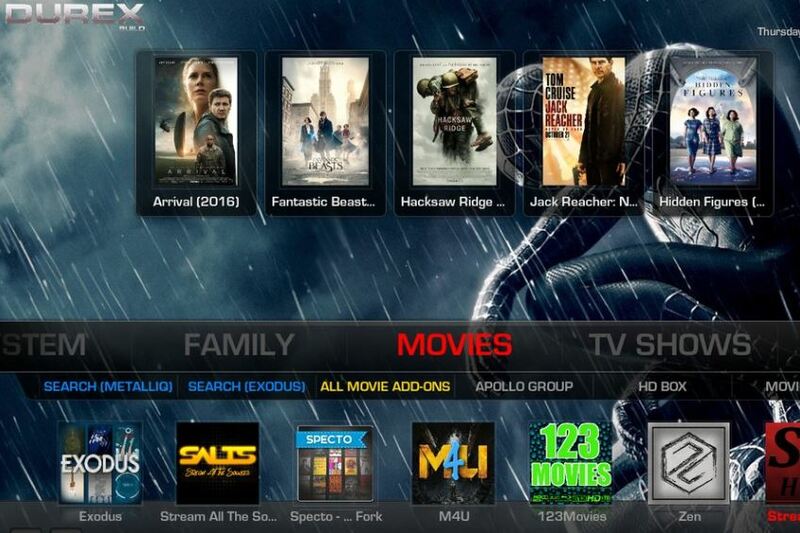 Now you should know how to use Kodi like a pro. If you want more apps for your Firestick that are even easier to use and install than Kodi, then check out my Firestick Jailbreak ultimate tutorial. Don’t Forget That the Home Button Takes You Out of Kodi! From here, if you want to get back to the Kodi Home screen, do not, we repeat, do not press the home button on your remote. Remember, the home button on your FireTV won’t work inside Kodi. If you press it, you will be taken to FireTV home screen. Therefore, you should press the back button on your FireTV remote instead.